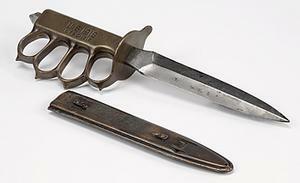 Large, dagger with silver-coloured metal blade, integral knuckle duster in the brass-coloured metal handle. With a sharpened pommel. Inscribed on handle: "U.S. 1918, L F & C 1918". Metal formed scabbard with integral belt loops. Marked "L.F.&C 1918". The specialized nature of trench warfare, as it developed during the First World War, spawned a variety of new weapons. 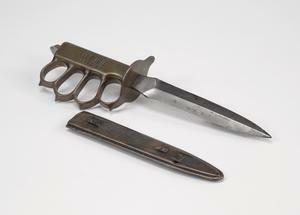 Many of these, such as clubs and knives intended for close quarter fighting, recalled more primitive eras of warfare. The US Mark 1 trench knife was one of two official issue fighting knives used by American forces during the First World War. It owed its design, which incorporated a heavy knuckle-duster grip, to tests carried out on knives already in use on the Western Front. 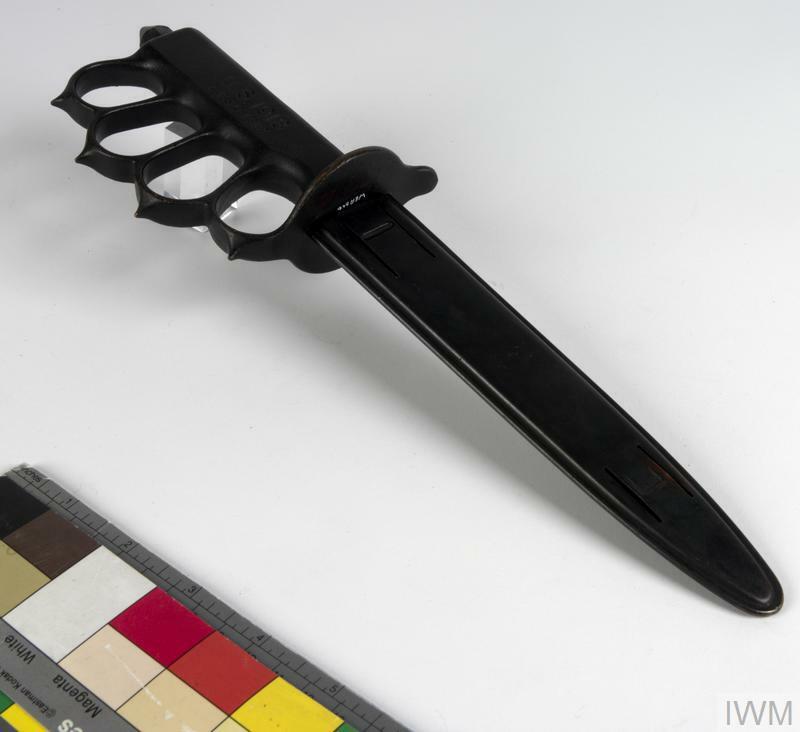 Formerly displayed (1985-1988) with the caption: "American 'Mark I Trench Knife'. 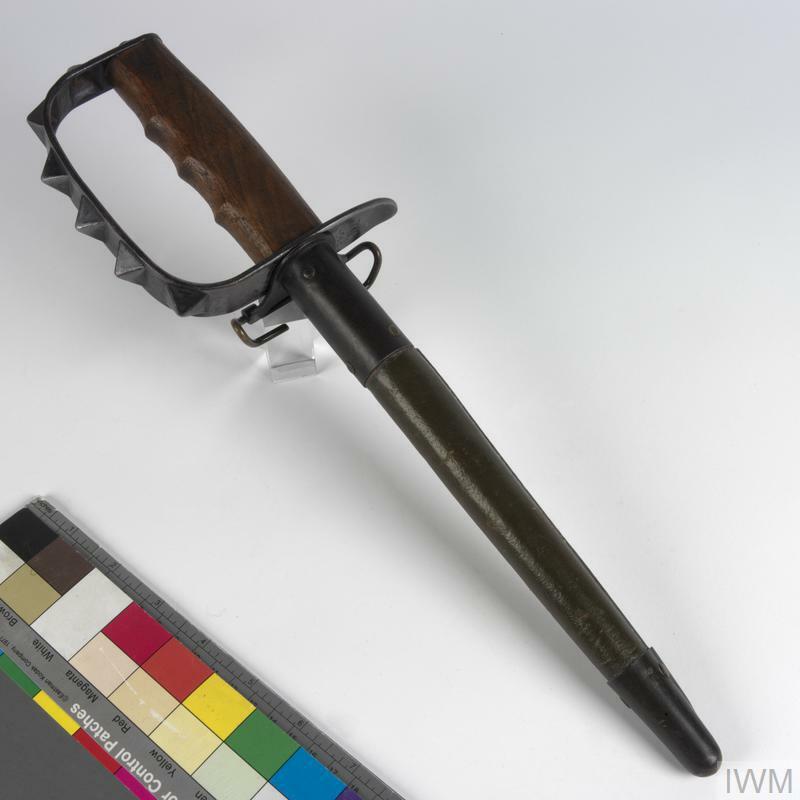 In June 1918 the American Expeditionary Force conducted tests on a variety of fighting knives in use on the Western Front, and as a result developed the weapon shown here."